A classically trained singer, cabaret artist and composer, Anna Braithwaite's work is distinctly theatrical in nature, thought- provoking, humourous and unexpected. Anna is delighted to have been selected for inclusion in the British Music Collection. This is a great resource for people interested in discovering the work of the UK's finest composers, past and present. Rebecca Collins has written a 'Spotlight' piece about Anna's work which you can view in full HERE. "For me, one of the many strengths of Anna’s work is the method she uses to generate original compositions. In listening to each piece, her presence at each site and the time spent with members of the local community become clear." If you are interested in hearing more about how Anna makes her work, please listen to the BBC Radio 3 broadcast of 'Look Up Doncaster' (scroll down) which includes interviews with Anna and other key players in the project or click below to hear her broadcast with Michael Betteridge on Resonance FM discussing verbatim technique in music. Anna's collaborative piece with artist Myah Chun and the Montrose Composers' Club, 'Chinese Whispers', has been selected for a vinyl release of contemporary experimental music by Migro Records. The launch was at Free Range in Canterbury and you can buy your copy HERE. Anna is writing a piece for orchestra jointly with Matt Brown, Aidan Shepherd and Phil Self of the Montrose Composers' Club, they will be holding their third workshop to finalise the piece at the end of August so keep an eye out here for progress reports! ‘In The Loop’ is the latest manifestation of an ongoing, iterative project intended to continually metamorphose and develop in unexpected directions. It began in 2017 as a conceptual piece called ‘Chinese Whispers’, a collaborative work based on the game of the same name between Anna Braithwaite, Montrose Composers Club, Myah Chun Grierson and Helen Lindon. The next stage of this project called 'In The Loop' saw Anna and Helen combining spontaneous fine art with improvised music. It was premiered at Profound Sound festival in February 2018. Anna and the MCC created tape loop recordings of instruments playing E flat and B flat held notes which, when relayed via a bank of cassette players, produced a warped, unpredictable ‘drone’. Helen used this soundscape as a source of inspiration for a work using ink and brush, created live on a rotating canvas. As Helen’s piece unfolded, it acted as a graphic score for Anna to interpret using her voice. Her vocals then fed back into Helen's artwork, making it unclear who was leading who. Above is a video of the live performance. Helen and Anna are currently experimenting with colour and the effect it has on the generated music. On June 1st they were invited to take the piece to the Rambert Studios to explore its potential with choreographer Luke Ahmet as part of the Rambert's 'Playground' scheme for professional artists. Luke, Helen, Anna and a small ensemble of dancers developed the piece further to include a live dance element which spontaneously interprets the music in real time. With the tape loops as a driving force, all three artists reacted to each other live, creating multiple feedback loops until the process becomes completely egalitarian. This track is a live recording of the newly formed female improvisation outfit 'Free Women' (Sylvia Hallett, Gemma Storr and Anna Braithwaite). This is the second set from their debut at the infamous experimental music night 'Free Range' in Canterbury, Kent, UK. In March 2018 I was asked to be a part of the 'Free Range Band' for the Free Range winter season finale. It was a great experience to be part of a 20+ strong group of improvisors led by Sam Bailey, David Leahy and Kat Peddle. With the support of Free Range I am looking to recruit more women to the 'band' over the next seven months so that by the time the winter season finale '19 comes around there is a more even split of men and women. Women are under represented in all aspects of the music industry. Like me, they often come late to composing having not had the encouragement or role models to make them look at careers in music other than teaching or performing. I am hoping to do my part to redress the balance by encouraging more women into improvisation and composition, starting in Kent. 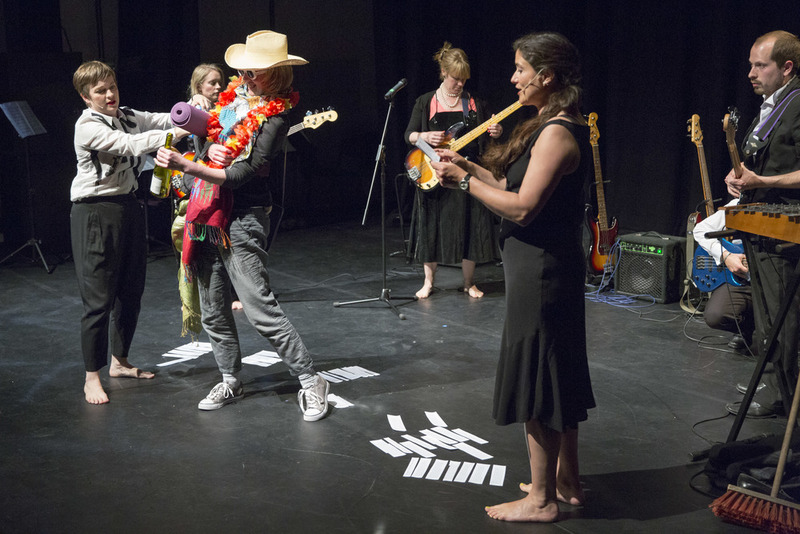 Free Women is an opportunity for women in Kent to meet and explore improvisation together through a series of workshops during spring 2019, culminating in a performance at the winter season finale of Free Range in Canterbury, Kent on March 28th 2019. I use improvisation as the engine for creating my music and hope that women musicians, music therapists, teachers, spoken word artists, sound designers, electronic artists and more will join me for a series of workshops led by inspirational women improvisors to explore their own creativity. If you would like to be a ‘Free Woman’ please get in touch and I will let you know more details. If you would consider helping me to find funding or donating to this project please also get in touch at annabraithwaite@me.com. Anna Braithwaite and the other members of the Montrose Composers Club each wrote a piece to be performed against the backdrop of 15 tape cassette players, all playing specially prepared tape loops for the groups' fourth concert 'MCCIV' at Profound Sound in Feb. '18. As well as premiering 'In the Loop' (for details read 'current projects' above) Anna also presented extracts from her recent 'gig lecture' piece 'Fanfare For A Seaside Town' and a new collaboration with musician Craig Gell and MCC member Phil Self interpreting a specially created graphic score and soundscape by sound artist Liz Hayward called 'Autumn Showers'. The MCC were also invited back to Canterbury's best experimental music night, Free Range, to perform pieces from MCCIV. On Saturday 27th January 2018 Anna and fellow MCC member Phil Self, invited the folk of Folkestone to try something new for 2018 and compose music, with the Montrose Composers’ Club at local arts hub Block 67. Participants created their own sounds in Phil's ‘mini studio’ using a granular processing app, samples and live instruments. Elsewhere Anna help people create and record their own tape cassette loops, whilst regular MCC collaborators Helen Lindon and Stewart Hughes encouraged children, OAPs and everyone in-between to create a large scale graphic score. At intervals the whole group would get together to form an improved orchestra which Anna conducted as they played the graphic score 'live'. EVENT: Exhibition and 30 minute gig lecture (followed by an informal Q&A) entitled 'Fanfare for A Seaside Town'. Part of a series of events in Customs House: Urban Room Folkestone, curated by artists for Folkestone Triennial. DATE: Friday 13th Oct. 6pm and Saturday 14th Oct. 11am, 2pm and 6pm. VENUE: Customs House: Urban Room Folkestone on Folkestone Harbour Arm, CT20 1QH. As part of a year long joint project, researcher Dr. Sophia Labadi, artist Andy Tuohy and composer/performer Anna Braithwaite invited Folkestone residents to make their voices heard on the subject of Folkestone’s future, focussing on the social impact of regeneration. This exhibition displayed artwork inspired by the themes which arose during a series of workshops and interviews with the local community and featured live music and analysis presented together in the form of an innovative ‘gig lecture’. Concept - Anna Braithwaite, Graphic score by Myah Chun Grierson, music created and performed by members of the Montrose Composers’ Club, 'action artist' Helen Lindon. A collaborative project based on the game of the same name. Anna Braithwaite invited Myah Chun Grierson to create a graphic score inspired by a text/artwork/object of her choosing. She responded to Amanda Gefter’s article written for BBC Earth, ‘The Strange Fate of a Person Falling into a Black Hole’. Myah presented the MCC with her graphic score from which they improvised a musical reaction without knowing the source material. The ‘whisper’ was passed on again during performances at Free Range 02/02/17, Profound Sound 03/02/17 and Turner Contemporary 03/06/17 to fine artist, Helen Lindon, who reacted 'live' to the improvisation she heard. Anna and the other members of the Montrose Composers' Club were busy at the start of this year preparing new works for their first concert at Free Range in Canterbury on Feb. 2nd 2017 and their return to the Profound Sound festival on 3rd Feb. 2017 at Folkestone's Brewery Tap. See the MCC website for details. Anna had two new works premiered, Chinese Whispers and The Wooden Knight. As part of ongoing experiments with collaborative writing Anna recently finished composing her first piece with Aidan Shepherd of the Montrose Composers' Club. Aidan gave the piece it’s name, 'The Wooden Knight' and wrote the first eight bars but only passed on the last two bars to Anna. She then added the next eight bars but only revealed the last two to Aidan. The process continued with each composer adding to what they were sent without knowing what came before, creating a compositional game of 'head, body, legs'. They did not discuss the piece during this process which happened remotely with communication via email. How does this modern way of working influence the outcome? Does a lack of personal communication create a disjointed clash of ideas or is it possible to make something bigger than the sum of its parts? Both composers found it an interesting methodology and have had their eyes opened to new ways of working. Anna was selected to be part of the Sound and Music Composer/Curator scheme 2015/16 which saw her and collaborator Michael Betteridge write and produce an evening of verbatim music theatre. The project, entitled 'In Their Own Words' (ITOW), had its premiere in Manchester on Aug. 24th 2016 and received further performances in Folkestone Quarterhouse and Hackney Showroom. For more details please go to the ITOW website. To create her new work, 'Eastbrooke's Adaptation', Anna used text taken from interviews she conducted with a young woman living with early onset dementia and combined them with questions and tasks which form the Addenbrooke's cognitive examination. "I liked the idea of juxtaposing my subject's exuberant conversational style with the bald and simple language used in the Addenbrooke's tests. The questions seem almost comically simple when held up against the complex real life experiences of the people it tries to assess." The piece is written for vocalist Rebecca Askew, percussionist Molly Lopresti and clarinettist Kat Browning and has been staged by director Nick Blackburn. CLICK HERE to view a video if the whole piece. In November 2015, Anna began her residency at Quarterhouse, Folkestone, with a 'Musicians’ Meet-up' for local instrumentalists, singers and composers. They workshopped some new material Anna had written, which she went on to develop during the rest of her residency. During spring 2016 Anna worked with director Emma Bernard and performers David Insua-Cao, Katy Rowe, Aidan Shepherd, Gemma Storr, Nicola Burnett Smith and Zoe Aldrich to create new material about addiction and the brain through a process of improvisation and collaboration. The project culminated in a 'scratch' performance of the work they had created entitled 'Brainsong' at the Quarterhouse 'Normal? Festival of the Brain' 2016 on Saturday 28th May. This project has been supported using public funding by Arts Council England and the Bliss Trust, Quarterhouse Folkestone and UCA. 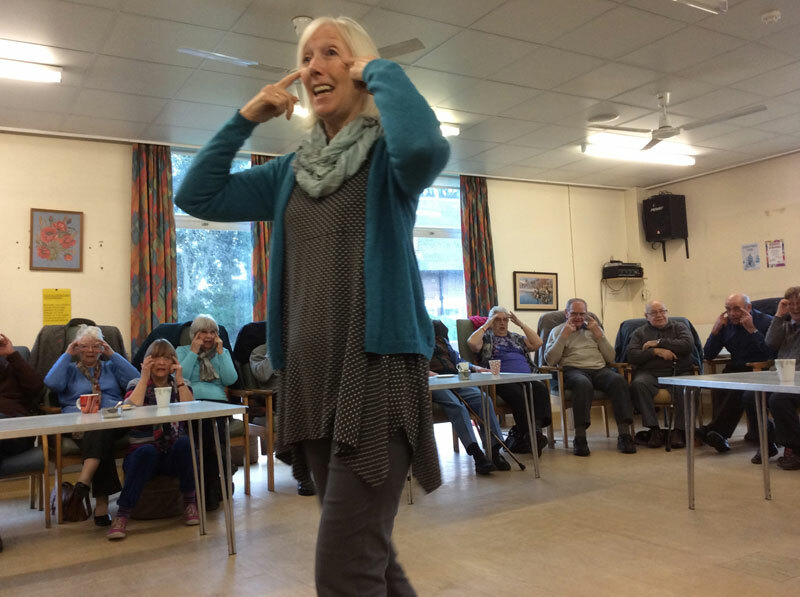 In October 2015, Anna started a commission for Music 4 Wellbeing to write a piece for three choirs of people living with dementia and their carers, as part of their project ‘Carers Create’. She ran sessions in Margate, Herne Bay and Canterbury at which she collected research and workshopped ideas with the singers. Choir members also enjoyed a song-writing workshop in which they helped Anna to create musical content for the commission. The choral piece with flute, guitar and accordion accompaniment entitled 'Tea and Symphony' received it's first performance by the carers create choirs and singers from Sandgate Primary School at: Quarterhouse Normal? Festival of the Brain on Friday 27th May 2016. The performance was part of a practical presentation about work that is taking place in creativity and dementia with presentations by Bright Shadow, Edith Tankus (The Archivists), Living Words, Sidney de Haan Research Centre and local support group the Sunshiners. Anna and the singers of the Carers Create project appeared on BBC1 on the 19th Sept. talking about their project together. You can catch the item on iplayer for 30 days by clicking HERE. Anna founded the Montrose Composers' Club in September 2015 with local composers Aidan Shepherd, Ian Fleming, Matthew Brown and Phil Self. The collective's debut concert 'MCCI' took place on the 12th February 2016 at The Brewery Tap gallery space, Folkestone, Kent. 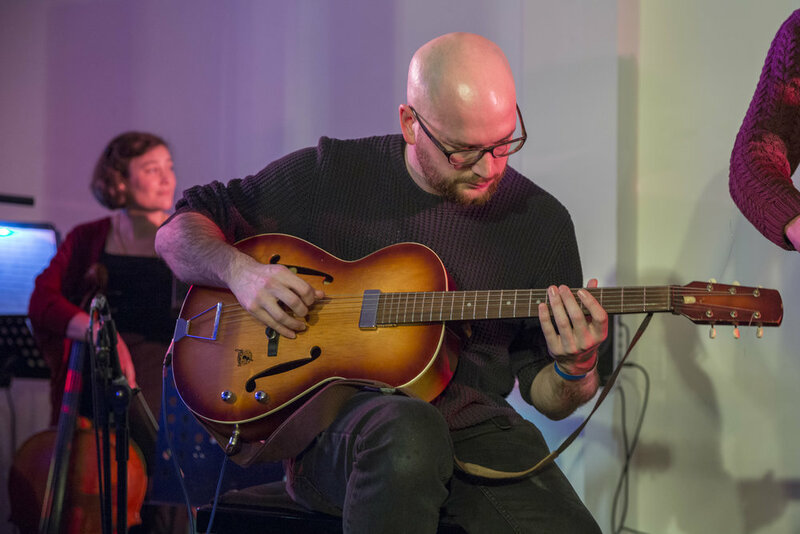 It contained premieres of seven new pieces and was part of the 'Profound Sound' festival, a weekend of new music and sound art (co-curated by Folkestone Quarterhouse and Folkestone Fringe). For this debut concert Anna created a new work for piano, cello and tenor sax called 'Fait Accompli'. The music accompanies a single performer operating a hand wound conveyor belt along which a collection of glass ornaments travels slowly until they fall off the end of the belt and inevitably smash in the bucket below. This piece looks at mortality and the absurdity of human existence. On October 2nd 2016 the members of the Montrose Composers' Club produced their secondconcert MCCII in The Waiting Room on Folkestone Harbour Arm. It saw the group write for a string quartet formed especially for the event, voice, hand bells and a host of other instruments. The informal performance was part of the Folkestone Fun Palace festival and included a chance for the audience to perform with the MCC and improvise some new music. To find out more about what the MCC are up to please visit their website. Anna was selected to take part in the 2014/15 Adopt A Composer scheme which pairs amateur choirs, orchestras, and ensembles with a composer for one year. It is funded by the PRS for Music Foundation and run by Making Music and Sound and Music. She was paired with the Quirky Choir of Doncaster and wrote a fourteen minute piece which they premiered on 20th June 2015 in Doncaster's market and Mansion House. It was recorded for broadcast by BBC Radio 3 (listen below). To find out more about the project please read Anna's blog. Anna was commissioned by Diane Dever and Jonathan Wright to 'animate' one of their 'Pent House' sculptures for their entrance into the Folkestone Artworks permanent collection on 21st June 2015. What she created was a ten minute performance, inside the water tower structure, of original music and words inspired by the sculpture and the Pent Stream from which the piece takes its name. Here is a video made by Dominic Pillai which combines footage of the live performance and a studio shoot. Anna wrote the words and music for 'Dr. Snowdrop', a mini operetta based upon a story told by Alphonse Allais at the Chat Noir Cabaret in 1880s Paris. It takes inspiration from the music of the 'Belle Epoque' and the performers at the Chat Noir such as Eric Satie. It was created for a show called The Entire History of Cabaret, which premiered at the Assembly Rooms as part of the Edinburgh Festival Fringe and toured theatres across the UK including the Riverside Studios, London. A commission for the Folkestone Fringe, this site specific piece premiered at the Cabin Cafe, Folkestone in October 2014. This is a live recording of that performance. Baritone and Violin - Alistair Bamford, Mezzo Soprano - Anna Braithwaite, Viola - Matthew Brown, Clarinet - Daniela Gajdosova, Violin - Karen Jolliffe, Accordion / Keyboard / Percussion - Aidan Shepherd, conducted by Tom Kilworth. Written for Alto solo, Soprano, Mezzo-soprano and Countertenor trio, Electric Bass, Trombone, Violin I and II, Cello, Drum Kit and Dustpans & Brushes. It was premiered at the Plural Muses concerts at St Michael's Church, Camden in August 2012. Written for the Bergersen Quartet and Nicola Burnett Smith (Bb Clarinet & Vocals), plus Kazoos. The lyrics were created from material provided by Jess Thom, A.K.A. Touretteshero. This piece was performed for the first time in October 2012 at St Bartholomew the Great Church, Smithfield, London as part of the SQ+ project (funded by PRSF). Written for Mezzo-soprano, keyboard and tape. Music and lyrics by Anna Braithwaite (after Burns). A piece which explores the possibility of The Large Hadron Collider creating black holes. Performed in theatres across the UK by Anna Braithwaite, Michael Roulston and Jake Pilikian. Arrangement for Soprano, Mezzo Soprano, Baritone and Piano for ShooShooBabys’ Christmas Party. Anna’s career began with Opera Holland Park and Carl Rosa Opera touring the UK in The Merry Widow, Die Fledermaus, The Gondoliers, The Yeomen of the Guard, Iolanthe, The Mikado and The Pirates of Penzance. 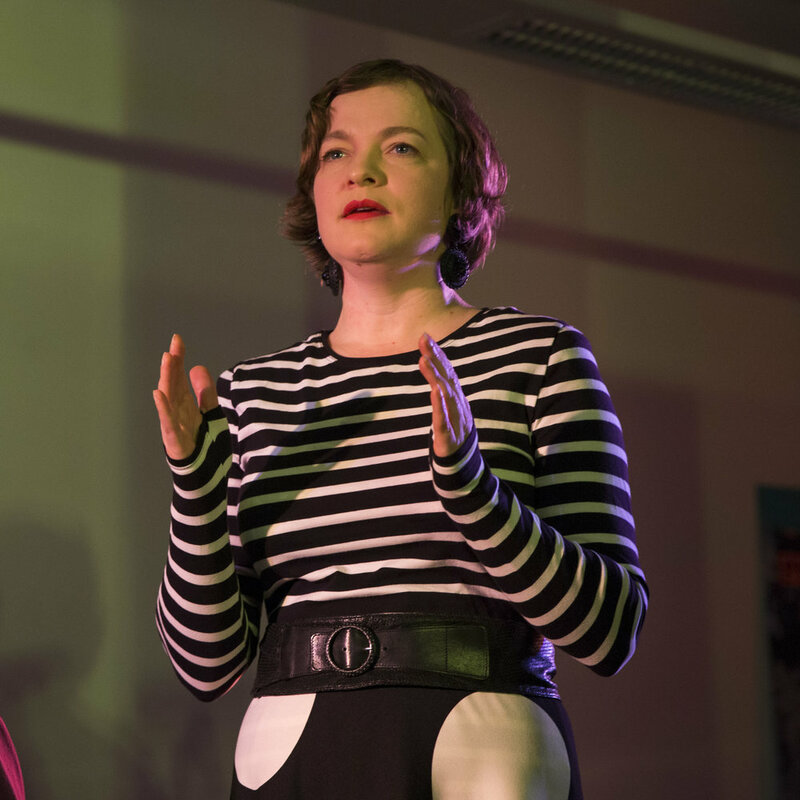 With Tanya Holt, she co-founded infamous cabaret duo ShooShooBaby, with whom she has devised & performed cabaret shows which have won acclaim at the Edinburgh Festival Fringe, on theatre tours of the UK and cabaret venues all over Europe. Anna has eighteen years’ experience as a singer working in opera, musicals and cabaret. She has taught singing at Pineapple Performing Arts School, London and for Bellestars pop parties and runs her own private practice from her studio in Folkestone, Kent. She leads the Creative Choir and teaches singing at Folkestone Academy and is visiting choir leader for Aylesham Ladies Choir. In 2016 she ran a workshop on devising new music and using verbatim technique for students at Canterbury Christ Church University, Kent and for International Womens' Day 2017 facilitated a DIY Punk Band workshop as part of the Older Women Rock festival with fellow musician Gemma Storr. To listen to the results click HERE. "You and Gemma helped me realise a lifelong ambition, i.e. to play the drums. I had the most wonderful time. You will never know how good the experience made me feel. I was like a child when I got home, too excited to sleep! I want to do it all again, tonight!" To request recordings, view sample scores, discuss new projects, collaborations or commissions, please email me. Thank you.